“This is a greeting to us all, the mana whenua and tangata whenua peoples living in the Canterbury region; from the mountain ranges of Te Wai Pounamu, the Southern Alps to the coastal and sea areas of the Waitaki River and north to Kaikōura, otherwise known as the Canterbury Plains. In Canterbury as well as nationally, Māori are a young, diverse and growing population group. The average age is 24 years with 32 percent of the total population under the age of 15 years. The percentage of older Māori (>65 years) is growing but is still less than non-Māori in Canterbury. It has been unacceptable for a long time for Māori to persistently have some of the poorest health outcomes but also significant gaps in mortality and morbidity. These disparities are a concern for everyone. Primary health care services are vital to maintaining and promoting the health for all population groups, in particular those groups with poorer health outcomes. There is strong evidence that primary health care can improve health outcomes and reduce health inequities, therefore it has a pivotal role for improving health outcomes for Māori. As of 31 December 2017, there were 41,135 Māori enrolled with a general practitioner of which 33,627 are enrolled with Pegasus Health general practices. A positive trend across all the Canterbury Primary Health Organisations shows an increase in enrolment for Māori. Māori have specific rights as tangata whenua that are protected through Te Tiriti o Waitangi. Māori also have the same rights as other New Zealanders to live long and healthy lives and to expect equal performance in their health care. Protection: working to ensure Māori have at least the same level of health as non-Māori, and safeguarding Māori cultural concepts, values and practices. He Korowai Oranga is New Zealand’s Māori Health Strategy and sets the overarching framework that guides the Government and the health and disability sector to achieve the best health outcomes for Māori. You can read about He Korowai Oranga on the Ministry of Health’s website. 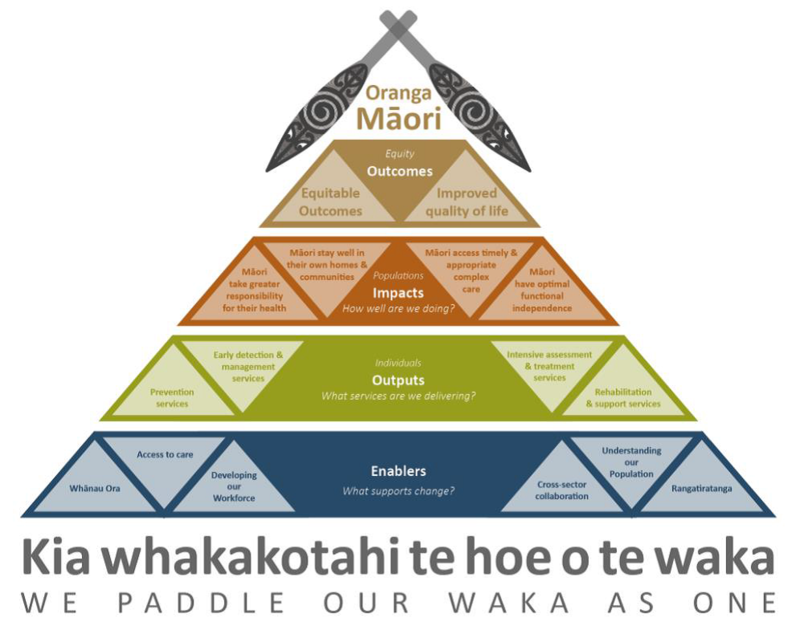 The Canterbury health sector’s work is guided by the Canterbury Māori Health Framework that has as its vision: “Kia whakakotahi te hoe o te waka – we paddle our waka as one”. The adage that “we paddle our waka as one” articulates the importance of all Canterbury service providers, Canterbury DHB, PHOs and NGOs, working together to reduce inequities, increase access to services and improve health outcomes for Māori in Canterbury. The Framework is aligned to He Korowai Oranga, New Zealand’s Māori Health Strategy, and identifies the desired outcomes and key strategies that assist in achieving equitable health outcomes for Māori. It also identifies indicators that can be used to measure progress towards Oranga Māori or supporting Māori families to flourish and achieve maximum health and wellbeing. Pegasus Health was integral to the development of the Canterbury Māori Health Framework. Read more about the Canterbury Māori Health Framework on Canterbury DHB’s website. Canterbury DHB’s Māori Health Action Plan outlines the key activities that will be undertaken across the Canterbury health system to improve Māori Health outcomes, along with associated measures and performance targets. You can read more about the Canterbury DHB Māori Health Action Plan on the Canterbury DHB’s website. Pegasus Health’s Hauora Māori Plan 2015-2018 is guided by the Canterbury Māori Health Framework and He Korowai Oranga, New Zealand’s Māori Health Strategy. The Plan interconnects with other Māori health plans, including Canterbury DHB’s Māori Health Action Plan. Increase HPV coverage and cervical screening rates for Māori women to at least target rates. Develop primary health care workforce through the development of Hauora Māori education. Build capability of whānau Māori (Māori families) to self manage. Pegasus Health improvement indicators and other reporting include Māori breakdown. Read the Pegasus Health Hauora Māori Plan 2015-2018.
Pegasus Health has a Hauora Manager role dedicated to the improvement of health outcomes for Māori and ensuring equitable access to primary health care services. Community engagement and relationship building with Māori health organisations and health promotion is a focus of this role. implementing health promotion programmes focused on Māori. As well as playing an important role within the organisation and progressing many of the activities within the work plan, Pegasus Health’s Hauora Manager works across the Canterbury system with other Māori managers and service providers. Pegasus Health began offering these scholarships to Māori students in 2001 and since that time, numerous aspiring recipients have been assisted, many of whom have gone on to outstanding careers in primary health care. Pegasus Health has always supported Māori governance of Māori health in Canterbury, first with the Māori Advisory Group from 2001 to 2009 then with Te Kāhui o Papaki Kā Tai (Te Kāhui) from 2009. Te Kāhui is a Canterbury-wide combined group of primary care organisations, Manawhenua ki Waitaha, clinicians, community organisations, Māori health providers and Canterbury DHB. The group plays a lead role in Māori health improvement by influencing across the health system to achieve health equity for all Māori living in Canterbury. Read more about Te Kāhui o Papaki Kā Tai under Our Governance & Structure > Advisory Boards & Groups. The Māori Caucus brings together Māori members from across the Canterbury Clinical Network (CCN) to provide a coordinated focus on equitable health outcomes for Māori in Canterbury. By strengthening connections and improving the capacity and capability of Māori members who participate on workstreams and Service Level Alliances, the Māori Caucus supports workstreams and Service Level Alliances to deliver outcomes that protect and improve Māori health. Read more about the CCN Māori Caucus on the CCN’s website. Pegasus Health’s Māori bi-line ‘kia atawhai ki te tangata’ was coined by a kaumatua (elder) from Te Ngāi Tūāhuriri, the local papatipu rūnaka (tribal council) who has mana whenua (jurisdiction) over the land on which Christchurch sits. The bi-line means ‘care for the people’. This is especially important to Pegasus as it appropriately focuses our work on the people and the communities we serve.